On Sunday, I was exhausted from being up until 2am. Still, an opportunity presented itself. There was a blood drive going on and I decided to donate. Now, I’m no stranger to giving blood. I’ve done it before. I’ve even blogged about it. 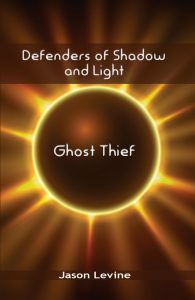 Still, this is an important subject so I figured I’d blog about it again. The whole process of giving blood is easy. When you arrive at a blood drive, you’ll be asked to sign in and will be given some information about blood donations to read. When you are called, you then go to a private area to be asked a few questions and some minor medical tests performed (blood pressure, pulse, etc.) The worst of these is the hemoglobin test where a finger is stuck to get a drop of blood to test. Even this only hurts for a second. When the tests are over, you will be left alone with a computer to be asked a series of questions that might affect your eligibility to donate. Once you are done with these, the donating process begins. 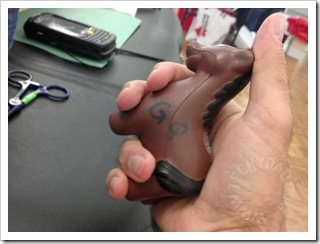 You will be escorted to a cot for you to lie down on and some kind of squeeze ball (or in my case horse) to compress. (This helps keep the blood flowing in your arm.) 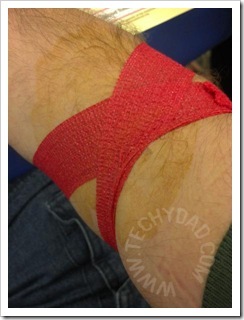 Your arm will be cleaned with iodine (to prevent any infections) and prepped the needle stick. 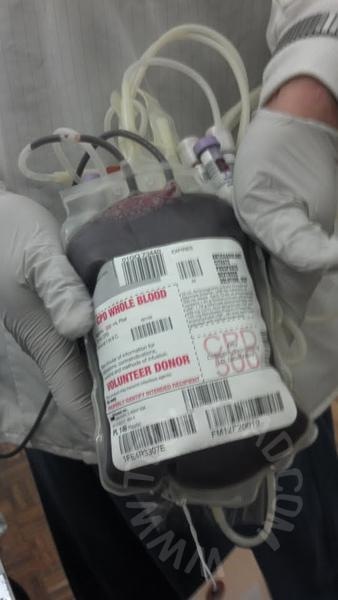 Even though I’ve given blood dozens of times, I always look away for this just in case I flinch. There’s a sharp pinching feeling but it quickly subsides. Soon enough, you are filling up the bag. When you’re done (about 10 minutes later), they fill a few vials (to be used in tests to ensure your blood is clean) and then the needle will be removed. (This is entirely painless, actually.) You apply pressure and raise your arm for a few minutes, get a bandage put on, and then carefully get up. Finally, you go to the snack table where you dine on cookies and juice (the extra sugar and sitting still helps prevent you from getting dizzy). 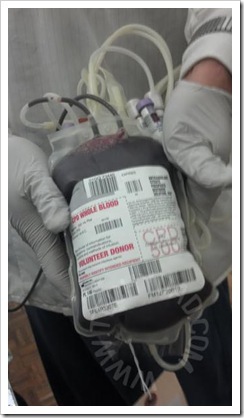 Once that bag of blood leaves the donation center, it can be used for three people. For a mere half hour to hour of your time, three lives can be saved. 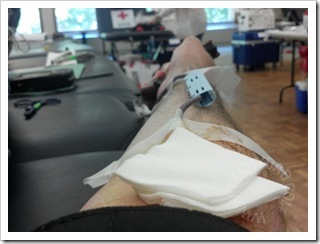 Since you can give blood every 8 weeks, you can theoretically save 18 people a year. However, it always seems like the blood supply barely covers the donations needed. 44,000 donations are needed every day. That’s 16 million donations a year. According to the Red Cross’ Blood Facts and Statistics Page, only 16 million are obtained per year. This means that the slightest fluctuation in our blood supply could mean people dying for lack of a blood transfusion. September 11th marks a day when a horrible act was perpetrated. However, it also marks a day when the world came together. When people joined as one to try to help those who were hurt. Over the years, divisiveness settled back in as is human nature. However, let’s rekindle this spirit of helping one another and keep it alive. Do something that will save the life of someone else. Someone that you don’t know. That someone could be black, white, Democrat, Republican, Jewish, Christian, Atheist, etc. The thing that matters is that they are human and your blood donation could save their life. 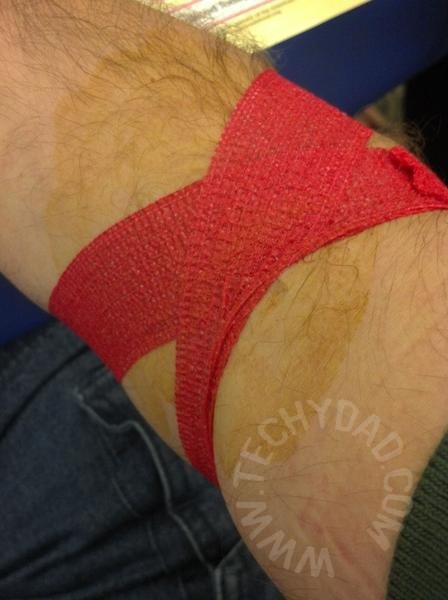 Go to http://www.redcrossblood.org/ and make an appointment to give blood. Go save some lives. Disclaimer: I was not compensated in any way for this post. This post is purely my own opinion.